Do you see Aaron Rodgers to the left? Do you see how nice he looks, sporting that iconic green uniform and yellow helmet? The same one Brett Favre wore...and Reggie White...and (basically) Bart Starr. It's truly an icon of the National Football League and it's hard to imagine the Packers wearing anything different. But what if they did? It seems like a near impossibility, but it actually almost happened once. "We will retain the current dark green, but will switch the pants and helmets from the present mustard yellow to a metallic gold. 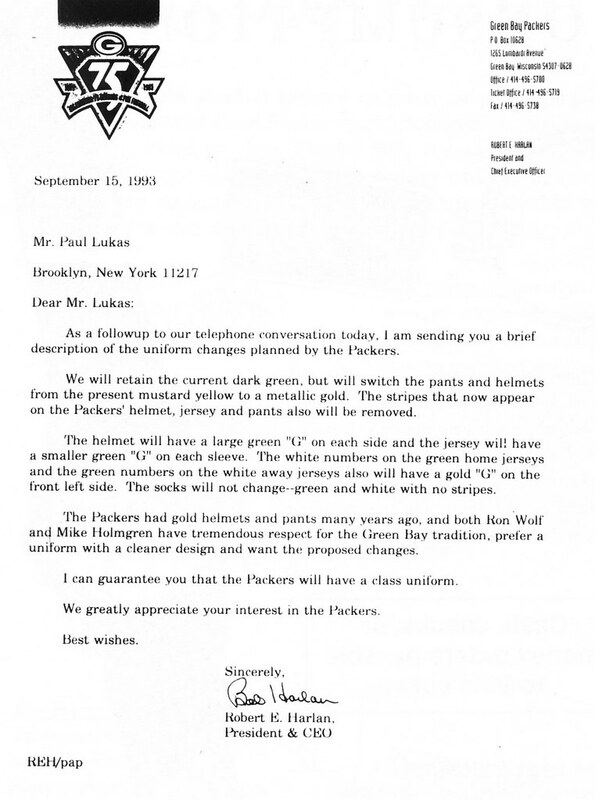 The stripes that now appear on the Packers' helmet, jersey and pants will also be removed." Can you imagine waking up one morning in 1994 and seeing a different Packer team than you'd ever seen before? What if the Packers won Super Bowl XXXI in a different uniform? Would we remember the Brett Favre-era differently if colors were different? Would this have opened up the door to perhaps another switch in the future, perhaps back to blue and gold on a permanent basis? There are so many questions that come up, but fortunately we don't need answers to any of them because the switch never happened.